Ever dreamed of a weightlifting shirt featuring a massive dumbbell mixed with a set of brass knuckles? Of course not, because it’s the minds here at Ironville that come up with this stuff, but we do it for you. We hope you enjoy this complete redesign of our original Blood Sweat & Iron. 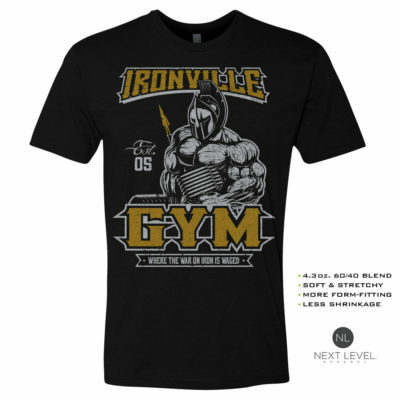 The large selection of bodybuilding clothes from us here at Ironville is designed and screened by hand right here in-house. We don’t produce our product in some warehouse full of inkjet printers.